You probably haven’t given much thought to Disney Interactive as a PC publisher lately. It’d be a bit odd if you had – they shut down Warren Spector’s Junction Point just after Christmas, and have since pumped out two Where’s My Water? sequels. But that back catalogue is not to be sniffed at, and a big chunk of it just landed on Steam in one big, snow-off-the-roof thwump. 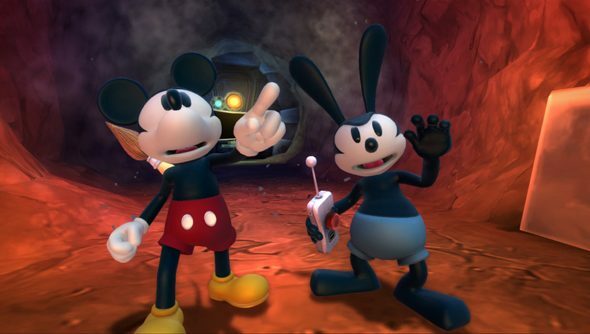 Epic Mickey 2 gets its first international PC release alongside Black Rock racer Split/Second, family-friendly MMO Disney Universe, and Steam versions of 18 other Disney games. Epic Mickey 2’s PC port was aborted once, and then released late last year in Eastern Europe only, for mad licensing reasons. This will be, for most of us, the first chance to play Junction Point’s off-tune swansong on the PC. The sequel complicated Epic Mickey’s conceptually-brilliant Fantasia riff with co-op and musical numbers, and reviewed fairly poorly. Here’s the rest of what’s hit Steam overnight. Some of it you might play; some of it you won’t. It’s still tough to think of the doomed “Deus Ex with the serial numbers filed off” Warren Spector was pitching to publishers at the time of Junction Point’s founding – but there’s some comfort to be found in having all of his games on the PC at last. Isn’t there?